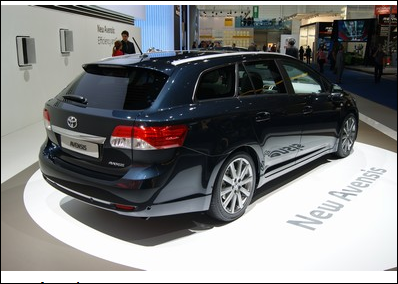 The new British built Toyota Avensis Tourer has been named the overall winner in the category of Family Estates during the 2012 Parkers Motoring New Car Awards. The decision was reached after realizing the cars economy on fuel consumption, low depreciation, great servicing, stylish performance and its host of brilliant features. The 2.0-litre D-4D TR model stands out from the entire fleet with its amazing quality and immense power on the road. The Avensis is certainly at home on the motorway too, making this vehicle a perfect choice for long distance cruising. The vehicle has recently witnessed amazing sales with many auto-market analysts attributing the change in events to the cars fashionable and chic design. It’s classy look quite simply says it all. Parker’s awards are based on real value for money so it is certainly worth considering a lease or purchase of this award winning vehicle. Not only does this Avensis Tourer look and feel classier than ever, it is versatile, safe, reliable and comfortable and would be a sensible and practical choice of vehicle. It even drives better and is noticeably more refined. Toyota is no stranger to winning awards, having recently been awarded for its “green” vehicles. This latest award is quite the icing on the cake! If you’re looking to purchase or lease a new Toyota contact our sales team. Alternatively, visit our website where you will find new and used Toyota’s available for sale or on finance.